with the "Dances of Universal Peace". Welcome to people of the earth. You are invited to join us in this caravan of singing,dancing, exploring nature, experiencing community in the Spirit of Peace. Singing and dancing is a universal language, just in case we will translate into english! 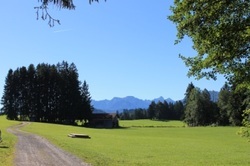 We are gathering in and round a farmhouserustic , nestled in a beautiful landscape near Seeg/Füssen, in the Allgäu region, at the foot of the alps. We are surrounded by lakes, mountains, meadows and forests. This magical landscape is a gateway for deep relaxation and personal growth. Facilities on site: a dance tent, a Meditation or Dance room, warm showers and flash toilets, and of course a fireplace. a shared kitchen for shared cooking, organic, vegetarian food. There is an early bird discount for bookings before May 19th 2015!